Everyone knows Owen Wilson as the funny man. He's in all of those hilarious comedies (if you like his type of comedies, which I do). I enjoyed him in everything from "Night at the Museum", "Cars" and "Shanghai Knights" to "Zoolander". I even enjoyed him in "You, Me and Dupree". Not so much in "Wedding Crashers". Yes, I know I'm one of the few who feels that way. But now, things aren't so funny for him. And, with Mr. Bean and I having gone through what we've gone through in life, I feel like I understand a little how he feels. And I really feel for him. It was hard enough for Mr. Bean and I to get through things, but at least we were able to do it privately and on our own terms and didn't have to let people know if we didn't want to. Unfortunately, he is not so lucky. One of the downfalls of being a celebrity. And one of the many reasons why I would never want to be one. It's weird - I feel absolutely no sympathy for Britney Spears, Lindsey Lohan, Paris or Nicole, but I really feel for Owen Wilson. It may be a bit hypocritical; and I don't know why I feel that way, but it's true. So, in case you haven't heard, go on over to the First Anniversary Spectacular on Saturndiary where Mr. Bean and I share the great news! 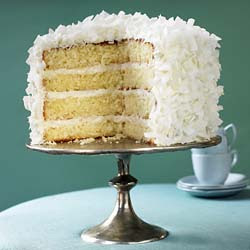 Also, in case you want to try the recipe for the yummy coconut cake I was manging on during the podcast here you go. And don't panic - it is easy peasy! I hesitated writing about this for awhile. 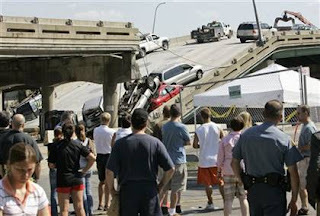 I feel so horribly for those who had to endure the fear and pain from what happened with the bridge collapse. And my thoughts go to those who are suffering as a result. The reason I didn't write about it though, I must admit, was not for those who suffered. It was for myself. Because those events of that day brought up one of my biggest fears which I have been trying to conquer for years. I fear and loathe driving over big and tall bridges. Living where I do, and traveling for my work as much as I do, I have to drive over some VERY tall and VERY long bridges quite often. I hate it each and every time. And when traffic causes me to be stopped on them for awhile, I fight the strong urge to jump out of my car and run for the nearest end. I feel every sway and bounce. I'm afraid someone is going to hit me and cause me to go over the side because I don't think the walls are high enough. I make sure my window is open in case I do go in, so I have a chance at getting out. If I'm driving, I refuse to look over the sides. If Mr. Bean is driving, I won't let him look at the view, make him drive in the middle lane and yell at him if he is speeding. It is all encompassing, and I can't breathe until we are over it. And, now, as a result of this horrific event and the long needed inspection and review of all national bridges showing that similar problems exist all over, I feel my fears are justified. So I'm really scared of the next time having to go over one of these bridges, knowing what I know about what happened. And God forbid if there is a traffic jam. Just writing about this is making my heart beat fast and my breath shallow. I am truly saddened and sorry for those who suffered from this tragic event. I also wish though, that I never heard about this happening. So I got depressed today. I was going over my 401k with our work's accountant. He was telling me how, in 30 years when I retire, Mr. Bean and I should be set nicely for retirement. WHAAAAT! 30 more years? That's about how old I am now (plus 4). You mean I have to work another LIFETIME before I retire? So I heard nothing about the financial aspects or details or whatever the hell these accountants say, all I heard was I have to work 30 more years. It's not that I'm lazy - I'm far from it. I've been working since I was 14, sometimes two jobs at once, and for the past 10 years, I've worked 70+ hours a week, including nights and weekends. But it just sounded so damn depressing that I have 30 more years of this. Why can't we have a ten year break in our 40's? Seems like we would enjoy it more then instead of at 60-something. I just don't understand those people who work until 70, 80, 90 or until the day they die. They supposedly love work THAT MUCH. Well, not me. I'm ready to retire at the ripe ol' age of 35 in October. What about you? Are you one of those "people" who love work THAT MUCH that you can't imagine not working?